Synopsis, Our Opinion: An energizing no-frills white wine that’s a great value. 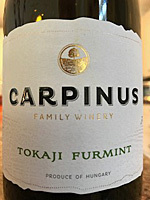 Producer/Winery: Edit and István Bai; Carpinus Family Winery; Tokaji, Hungary. Paired With: Homemade bread right out of the oven and Camembert cheese. Chilled before opening. Clear, about as colorless as it can get, but with just the slightest gold tint. Strong citrus, fresh cut Granny Smith apples and Mock-orange (Philadelphus coronarius) blossom aromas. Smooth, polished, medium body and fine 1000-grit texture. Unusual fresh flavors of lemon, lime and pineapple all wrapped around a FANTASTIC pronounced mineral core. Abundant crisp acidity and a long refreshing finish that ends with a mineral and a tropical fruit taste. This was a real WOW wine; potent flavors, fresh easy drinking, brisk & refreshing acidity, with both a tartness and tropical fruit sweetness that would satisfy even the most discriminating wine-drinkers. The “perfect” white wine for a lively garden or patio party. Furmint is a rather eccentric grape that you probably won’t find on grocery store shelves, but this was an energizing no-frills white wine that’s a great value. Comments: Learn more about the Carpinus Winery and their wines. Imported by: Rise Over Run; Swannanoa, North Carolina.